2010 was one of the great years in the history of soccer in the Philadelphia region with a bounty of riches across all levels of the game. 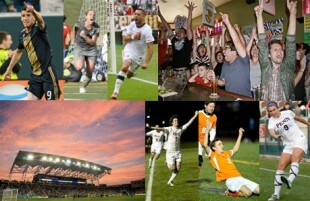 Some of the reasons why this was such a great year for Philly soccer are obvious, some less so. Let’s start with the obvious. Philly soccer fans were blessed with the arrival of not one, but two professional soccer teams and their very own very awesome stadium. The Philadelphia region has long been one of the most fertile areas for the breeding of soccer lovers—and players—in the country, which goes some way in explaining why the Philadelphia Union had a supporters group long before the team existed, let alone had a name. Say what you will about this chant or that, the Sons of Ben not only helped to get the Union here, they helped Philly soccer lovers give focus to their support as the Union struggled to find their feet on the field. That support must in the minds of the players as they battled through the beginning of their first season. After all, when an expansion team has a schedule in which only two of its first ten matches are home games, memories of home had better be good. And good they were: when 34,870 people show up for that team’s first home game, the team had to know they have a fanbase that would stick with them through thick and thin. And when, after what seemed like an eternity, PPL Park finally opened, packed to the gills with exuberant fans late in June, home sweet home must have felt that much sweeter. As the summer heat turned evermore brutal there were some awful, frustrating lows, with points squandered and poor play. But that frustration was, as often as not, indicative of the highs, which showed both the promise of some exciting young players—including a certain Frenchman—and of an organization built for the long haul on the principle of attractive, attacking soccer. In the end, feeling like your team is only a couple of players away from becoming a major force in the league is not a bad way to finish an inaugural season. Although sometimes lost in the Union’s glow, the first year of the Philadelphia Independence proved to be a better one on the field as the expansion team fought their way through a grueling playoff schedule to the WPS Final. Led by a bevy of talented international players including three US internationals, the Independence played a different brand of attacking soccer than the Union. But, anyone who watched them saw a tough and entertaining team. The problem for the Independence, and for the league, was not enough people were watching. The first year of the Independence was the second year of WPS. Before the season started, one team, LA Sol, had folded. Only a few months into the second season, another team, St. Louis Athletica, folded. 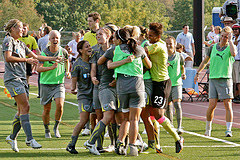 After the league’s second season, two more teams—league champs FC Gold Pride and the Chicago Red Stars—folded, although another, Western New York Flash, joined the league. The Independence have all the stuff necessary to make another run for the league title in 2011 and their move from West Chester to Widener should help them to see better attendance. The big question will be whether the league has all the stuff it needs to survive into 2012. 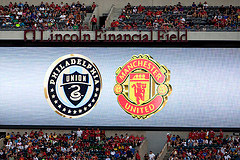 The Union hosted three international club friendlies. The first one against Celtic came off despite a veritable flood of rain before the game and my friends in Glasgow still can’t believe the Union won. In July, some 44,213 showed up to see the Union play Manchester United at the Linc and it took them 76 minutes to score. In September Chivas came to town and young Jack McInerney scored the game’s only goal while the even younger Zach Pfeffer saw his first minutes in a game with the big boys. The Philadelphia region was host to three national team matches in 2010. At the end of May, some 55,407 showed up to see the US Men against Turkey in their last warm-up game in the US before heading to South Africa for the World Cup. The match turned out to be something of a harbinger of what to expect at the World Cup with the US conceding a goal first before battling back, in this case for a 2–1 win. It was a freaking fantastic day. 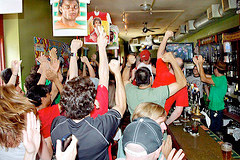 When the World Cup kicked off, fans flocked together across the region to watch. The cynicism of soccer haters simply ceased to matter and old soccer heads could rest easy in the knowledge that the sport seemed to have finally clawed its way back into the national consciousness. In October, PPL Park was host to both a US Women’s and a US Men’s match. It’s true that attendance was not very good for either match—2, 505 for the Women against China, 8,823 for the Men against Colombia—but, among other things, it is also true that: the US Men had played Brazil in East Rutherford barely two months before; Colombia isn’t exactly the biggest draw and both games were meaningless; and the Phillies were in the playoffs. In the end, what was important was that PPL Park had been recognized as an excellent facility both worthy and of hosting such international events. Besides, the day after the match against China, the Union played LA Galaxy and set a PPL Park attendance record of 18,779; a week later 18,578 came out to see the Union against the Red Bulls. If anything, Philly soccer fans showed they knew what was what when it came to spending their hard earned money and time. Let us not forget that Lori Lindsey, Heather Mitts and Amy Rodriguez are all regulars on the senior USWNT, or the national team appearances of the Union’s Jack McInerney and Amobi Okugo, or Zach Pfeffer’s selection for the IMG Academy in Brandenton. Finally, Philadelphia topped the leader board of votes for host cities in the US bid to host the 2022 World Cup and had done so for months. Yeah, the US isn’t hosting the 2022 World Cup, but Philadelphia did its part in showing the game is truly in us. Area college’s enjoyed success in conference play (the Princeton and Penn men’s teams finished first and second in the Ivy League, the Penn and Princeton women’s team finished first and second; the La Salle and Temple men’s teams finished second and third in the Atlantic 10) and the Penn and Princeton men qualified for the National Championship tournament, as did the Penn women. Attendance was up at games, too. Rudy Fuller, coach of Penn’s men team for thirteen years, said attendance was the best he’s ever seen, thanks to the Union coming to town, the World Cup, not to mention the level of play in college soccer simply being better then ever. Local players received acclaim at out-of-state colleges, too. Pottstown-native and Boston College senior Karl Riddick was invited to the MLS Players Combine, as was Reading-native Corey Hertzog from Penn State and Lancaster-native Zarek Valentin of the national championship University of Akron team. 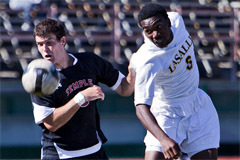 Both Hertzog and Valentin were among the nine players named to the Generation adidas class of 2011. Havertown-native and University of Virginia star Sinead Farrelly was nominated for the Hermann Trophy for the second year in a row and hopes to continue playing professionally. The Archbishop Wood girls’ team made it to the PIAA AAA final, the Archbishop Wood boys’ team to the AA final. New Hope-Solebury High School won the PIAA Class A Boys’ Championship, the first championship for the school in any sport. The Hammerheads of FC Delco made it to the US Youth Soccer Under 19 National Championship. Two area clubs were selected by S0ccer America for its top 30 boys clubs and girls club lists. FC Bucks came in at 14th on the girls club list. On the boys club list, which includes a number of MLS affiliated clubs, FC Delco came in at 23rd. Amateur club soccer thrives at less exalted levels throughout the Delaware Valley. The Inter-County Soccer League, to pick from just one of the leagues that belong to the Eastern Pennsylvania Youth Soccer Association, has more than 70 clubs with more than 650 teams fielding more than 10,000 players. And it’s not just the kids who are playing. United German Hungarians celebrated their 100th anniversary by hosting the United States Adult Soccer Association’s National Cup final. Philadelphia’s adult amateur Casa League now has more than forty teams in four divisions. Media coverage of soccer in Philadelphia went from next to nothing to a bit more than something in the space of a year. 6abc showed Union games. CSN showed Independence games. Philly.com now actually has a tab for the Union on the navigation bar of their sports section and (somewhat) regularly provides original coverage by actual professional journalists. Is it as good as it could be? No way. But it is a step in the right direction. 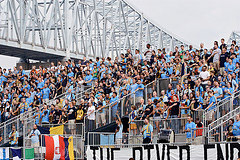 And the coverage they don’t provide simply provides space for the blogs and podcasts covering the Union and Philadelphia soccer that have sprouted up all over the Internet. Yeah, 2010 was one for the ages when it comes to soccer in the Philadelphia area. Here’s looking at you, 2011.